My Child’s Out of School — Eek! Are you quietly (or not-so-quietly) dreading your child’s school summer vacation — wondering how you’re going to fill the vast expanses of hot days with “bored” kids? How you’re going to stick to your values about screened media, while retaining your sanity? Oh, and by the way, hopefully enjoying some semblance of calm and enJOYment?! 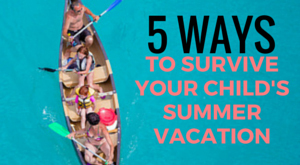 Here are five guidelines to help you not just survive summer, but actually cultivate more ease & harmony as you “wire” yourself and your children for joy & wellbeing in the coming year! Before reading more about these Summer-Sanity ideas at mothering.com, here’s a little “secret tip” that will help ensure the success of any routine you come up with — for summer or anytime! This entry was posted on Tuesday, June 2nd, 2015 at 5:51 pm	and is filed under Parenting for Peace. You can follow any responses to this entry through the RSS 2.0 feed. You can leave a response, or trackback from your own site.